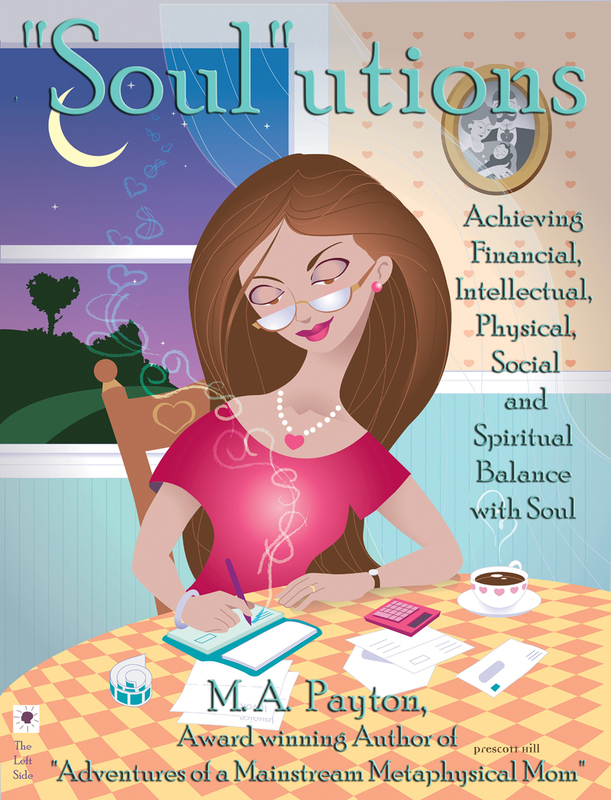 SRP: $14.95 | #Pgs: 239 | ISBN: 978-0-9719804-1-9 | 6 x 9 paperback | SOULutions: Achieving Financial, Intellectual, Physical, Social and Spiritual Balance with Soul by M.A. Payton. “Soul”utions presents stories, techniques, and tools that Michelle has used for herself and others to achieve soul-balanced happiness. You’ll read real life examples of how she and others achieve or don’t achieve their goals in the five main areas of life: Financial, Intellectual, Physical, Social and Spiritual. With this also comes a way to soul map (an actionable plan that combines non-physical and physical goals). This fun to read, informative, and thought provoking book is sure to be a key to achieving your ultimate reality. 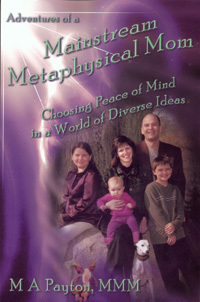 SRP: $13.95 | #Pgs: 192 | ISBN: 978-0-9719804-0-2 | 6 x 9 paperback | Adventures of a Mainstream Metaphysical Mom: Choosing Peace of Mind in a World of Diverse Ideas by M.A. Payton. 2003 Finalist—Best Biographical/Self Help Book awarded by Coalition of Visionary Resources Trade Association/International New Age Trade Show. Called a “practical guide to living,” this is one of the best metaphysical introductory books available and an easy, fun read. This reveals what Mainstream Metaphysical parenting, mentoring, partnering, and doing relationships with self and others in the 21st century is all about. Walk down the path of continuous change as you explore a Universe of Free Will, The Miracles of Everyday Life, Synchronicity, Trusting Your Intuition, Your Soul Journey, Creating Your Heart & Soul Plan, Being Okay that You’re Not Okay to Everyone, Balancing Yourself 24/7! 2006 Finalist—Best General Interest/How To Book awarded by Coalition of Visionary Resources Trade Association/International New Age Trade Show. 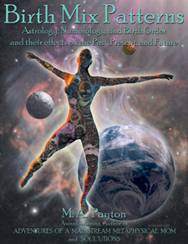 SRP: $12.95 | #Pgs: 157 | ISBN: 978-0-9719804-2-6 | 6 x 9 paperback | Birth Mix Patterns: Astrology, Numerology and Birth Order and their effects on the Past, Present and Future by M.A. Payton. What do Astrology, Numerology and Birth Order have in common? Translate how birth mix reveals how you and others are motivated, what this mean to finances, your ability to expand intellectually, physically, socially, and spiritually. Hundreds of U.S. Presidents and First Ladies, Artists, Authors, Civil Rights Leaders, Entertainers, Heroes, the Rich and Famous, Royalty, Scholars, Spiritual Leaders and more being analyzed to demonstrate how the birth mix process works. 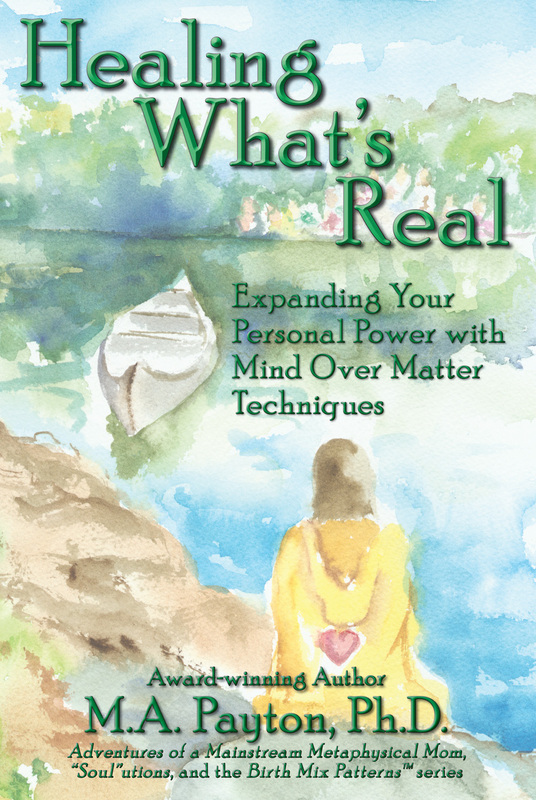 SRP: $15.95 | #Pgs: 251 | ISBN: 978-0-9719804-5-7 | 6 x 9 paperback | Healing What’s Real: Expanding Your Personal Power with Mind Over Matter Techniques by M.A. Payton, D.C.H.. Mind over matter concepts play an integral role in maximizing your personal power, because you dig into what is already yours—your consciousness, sub-consciousness, and (if you’re really listening) universal truth. Dr. Payton shares her experiences with hypnotherapy, Neuro-Linguistic Programming™, Emotional Freedom Technique™, meditation, and more with dozens of transcribed sessions and interviews combining these many techniques. Exercises are covered in all areas of life. 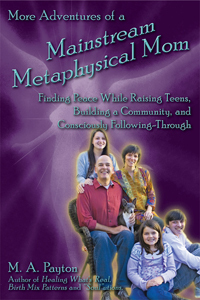 More Adventures of a Mainstream Metaphysical Mom: Finding Peace Raising Teens, Building Community, and Consciously Following-Through by M.A. Payton | ISBN 0-9719804-6-4 | $15.95 (U.S) s.r.p.| 225 pages. This book is for those who have ever parented, grand parented, aunted, uncled, mentored, or regularly observed parenting and explore alternative routes. It’s for those who consider themselves “out of the box” or “open-minded,” and are wading through constant changes wondering where they fit in a world where, sometimes, there are no hard and fast rules. It’s for those looking for something higher but not in the traditional sense of the word. Reviews: “Michelle Payton is, indeed, one of my all-time modern day metaphysical mothering heroines! “–Leta Hamilton, Seattle, WA Area, Author & Presenter, www.thewayofthetoddler.com. 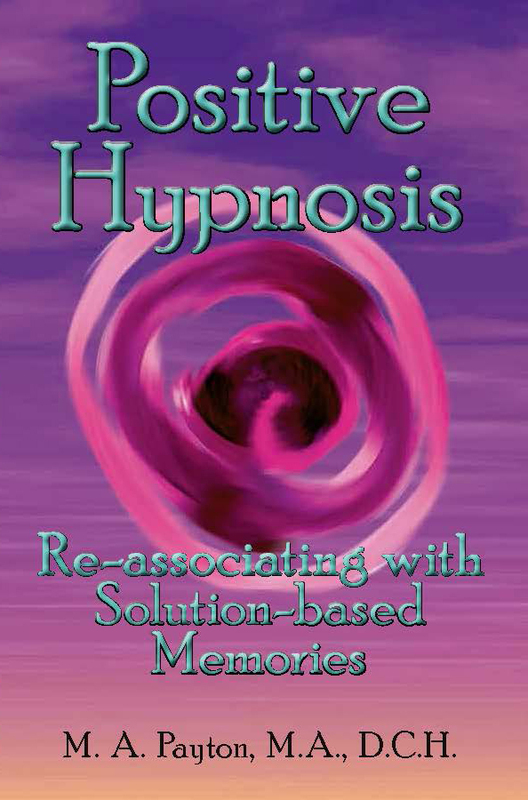 SRP: $12.95 | #Pgs: 63 | ISBN: 978-0-9719804-9-5 | 6 x 9 paperback | Positive Hypnosis: Re-associating with Solution-based Memories by M.A. Payton. All experiences create unique realities for each person, so when new information is absorbed into the human brain—like a perception that something doesn’t work, re-connections to past experiences must be strong enough to re-position beliefs and habits. Those who are interested in self-empowerment using mind over matter techniques will find facts in Positive Hypnosis on how the brain learns through re-association and why blocks occur in a healthy brain, why re-association is a key to individual re-thinking, and how Hypnosis, Self-Hypnosis and Neuro-linguistic Programming are experienced every day to dispel the perception of being controlled. A process will be laid out on how to collect and re-use memories for problem-solving, plus methods on how to remain focused on one core need at a time. Those interested in self-facilitation, as well as professionals in the mind over matter field, will find helpful templates to put all the steps together to complete learning cycles and re-adopt positive habits. 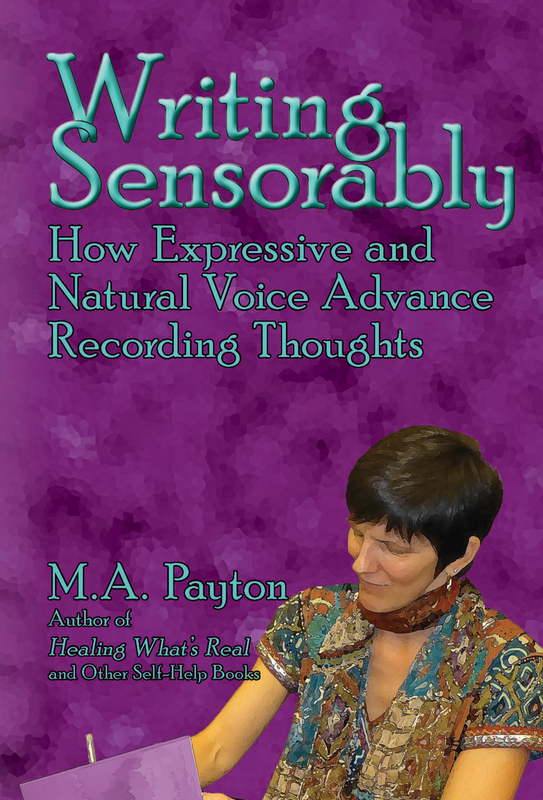 SRP: $13.95 | #Pgs: 131 | ISBN: 978-0-9719804-7-1 | 6 x 9 paperback | Writing Sensorably: How Expressive and Natural Voice Advance Recording Thoughts by M.A. Payton. Writing Sensorably is for those who are interested in ways to record as much content as possible prior to polish stage. The author marries expression with practical steps that enhance: – self-help processing, – scientific observations, – creative writing, – journaling, – descriptive work using multiple senses — seeing, hearing, tasting, smelling, tactile or touching, – technical or methodical work with an interest in how published papers and research support out-of-the-box processes. The common link is demonstrating how natural voice and sensory-based writing contributes to even the most highly disciplined work. Ultimately, left and right-brained communicators and writers will understand how storytelling, writing and even reading experiences enhance the recording and writing processes. 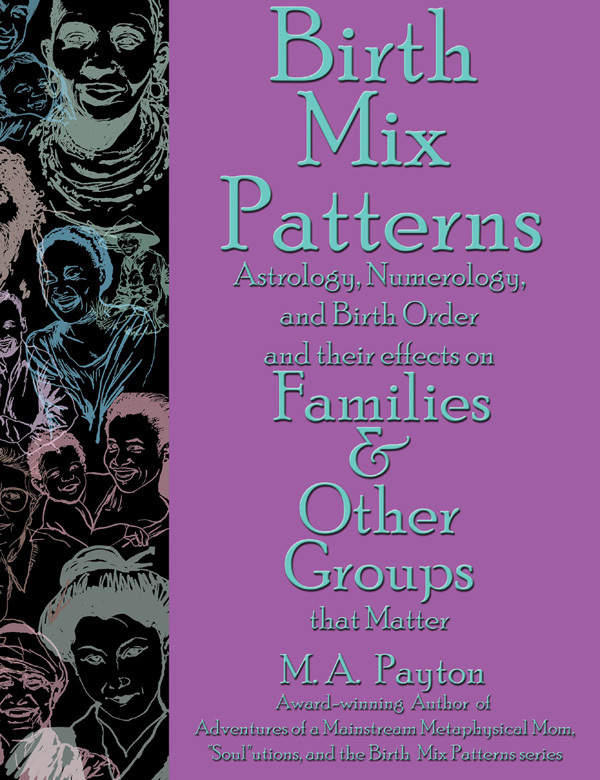 SRP: $12.95 | #Pgs: 137 | ISBN: 978-0-9719804-4-0 | 6 x 9 paperback | Birth Mix Patterns and Loving Relationships: Using Astrology, Numerology and Birth Order by M.A. Payton. With the Birth Mix Patterns process, using Astrology, Numerology, and Birth Order, learn how knowing who you are, and respecting your partner’s mix is the key to having a long-lasting, loving relationship. 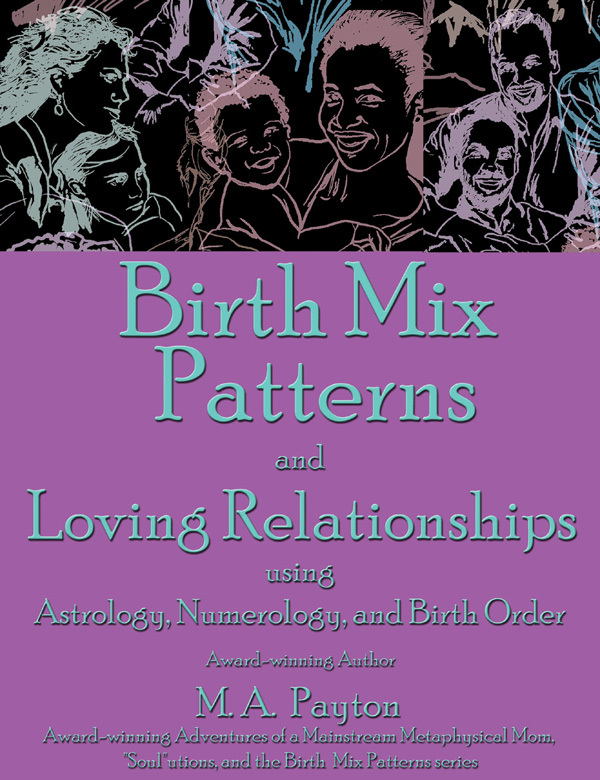 In this third book in the Birth Mix Patterns series, there are more than two dozen studies of famous couples.